What does it mean to be a Feminist Hawk? Why do we use that term? The meme originates in a single issue: Islamofascist misogyny. This New York Times article identified David Horowitz and FrontPage Magazine as examples of Feminist Hawks. According to the Times‘ piece to be a Feminist Hawk was to take a hardline on Islamist regimes because of the Muslim world’s mistreatment of women. The Godmother of Feminist Hawkdom, Dr. Phyllis Chesler, was unfortunately not mentioned — an unacceptable injustice akin to ignoring Albert Einstein were one talking about physics — though she wrote about it here in a must-read essay which further defined the term. Robert Spencer, another crucial figure in this developing movement, also blogged about it here and listed numerous articles he’d written on the subject. Here at NRB we want this to only be the starting point, though for what it means to be a Feminist Hawk. To be a Femininst Hawk is not only to champion this vital cause but also to adopt a style and an attitude. Feminist Hawks are confident, aggressive, and confrontational. They fight and will not be bullied. And our Feminist Hawk superheroine is meant to both symbolize and inspire these sentiments. The Feminist Hawks’ Nest won’t focus exclusively (or even primarily) on Islamic gender apartheid. The idea is that the contributors embody the Feminist Hawk spirit no matter what they’re writing about, be it reality show antics, Alinskyite political tactics, or faux feminism. 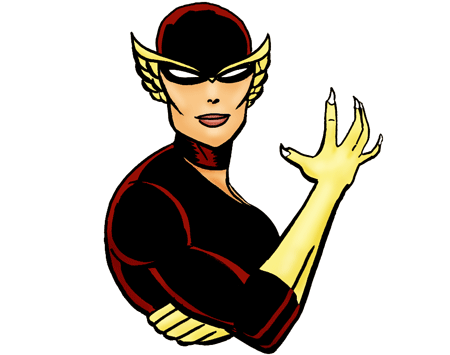 Big thanks to Bosch Fawstin for an outstanding job on the Feminist Hawk graphics, and Dr. Phyllis Chesler for being kind enough to promote The Feminist Hawks’ Nest on her Chesler Chronicles blog.